As well as my legs feeling a bit weird over the last few weeks, I had a late night yesterday and as a consequence was absolutely shattered all day today. I injected on Tuesday night as normal and Wednesday morning was one of those days where I woke up feeling as though a giant invisible hand was pushing me back into the mattress. The day was a bit of a struggle, but because I'm stubborn, I attended the first of the season's interval sessions at the Embankment that evening. I didn't feel great then and the late night just finished me off. I didn't even really do anything too exciting and actually ended the evening at about 1am sitting on my kitchen floor trying to work out why my newly installed bicycle tyre looked wonky.... but it's been a long week and I paid the price for my exertions today. This evening, I reluctantly decided that I should probably give it a miss. I like to think that I can push through fatigue most of the time, but I've been head-swimmingly, bone-achingly tired all day and just didn't think it was a good idea... especially since my fall the other day. Naturally, my masochistic streak now means that I just feel lazy and weak for not going. My urge to punish myself is strong indeed. 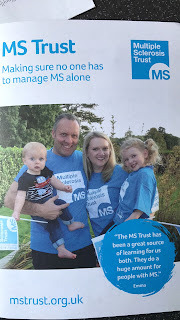 Still, to cheer me up, I received a leaflet through the post today from the MS Trust. I've always felt as though I had unexplored potential as a page three pinup and, at last, my dream has become a reality! I'm fairly sure that this will soon be a collector's item, so my advice would be to grab hold of a copy as soon as you can. Available in all good hospitals and MS Clinics across the land. If you feel that the value of this publication could be greatly enhanced by a signature, then I will be more than happy to oblige. If you ask her nicely, my wife might also scrawl her name across her delightfully betutu-d derrière for you too. And she might sign the picture too.